Hi everyone! Today I'm showing you one of my current favorite trends, and how I styled them. Band Tees! Band tees are so in and so rad. They're an absolute essential for your closet. I wanted a band tee that was super chill and that was super diverse yet so in. And today's post has an exciting twist to it. I'm showing you the same bottom with two different band tees. 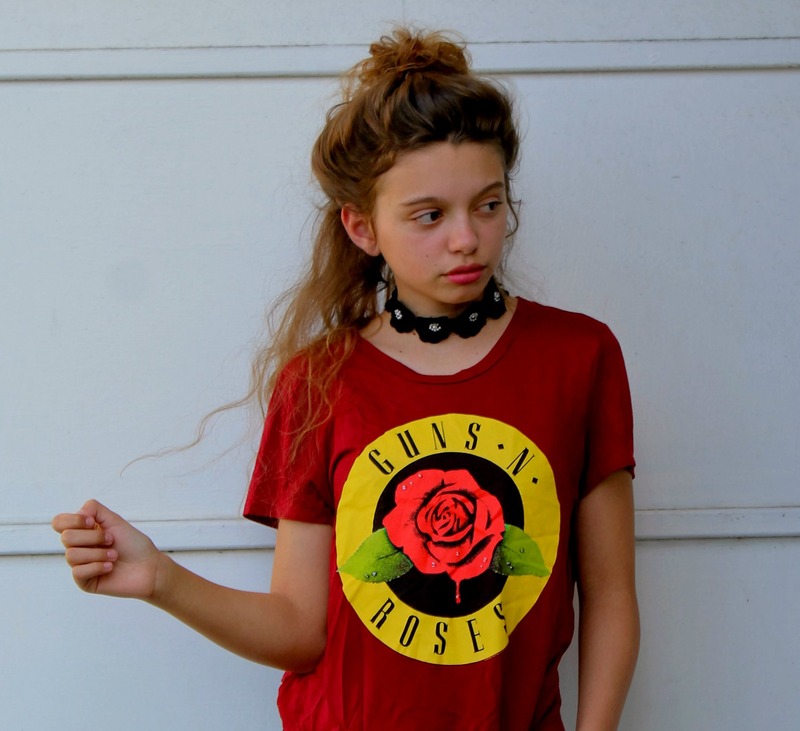 This first look is "Guns N Roses." I love this top because it's my parents favorite band, but it's the perfect red and the perfect length! (Not a crop top but not too long.) To pair this, I wanted a perfect bottom. 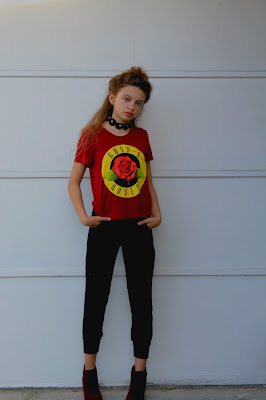 I picked something edgy yet comfortable and decided on these fabulous black zipper pants from Rosie G. I love these bottoms, because there perfect for school (good for dress codes) and any season. Since the look was super casual I wanted to pair it with a thick heel to dress it up a little. So I did! I'm wearing these burgundy heels from Jessica Simpson. I'm absolutely in love with these, because there super easy to walk in and can be easily dressed up or down. I also added this adorable choker that I purchased from Forever 21. 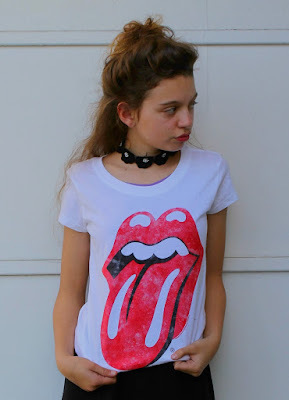 The next look is from another popular band, "Rolling Stones." I'm wearing the same bottoms and shoes, but a different band tee. This top is a classic and so popular, but it never goes out of style, which is what I love about this tee. For both of these looks I kept my hair a little wild yet classy with a top knot. It definitely completes the look. I love the style of band tees because there so timeless, and so fun to style! Go get your band tee!